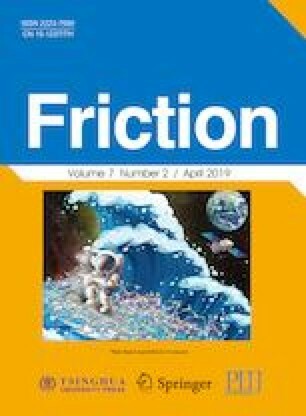 Insulated polyimide (PI) composites filled with short glass fibers (SGF), polytetrafluoroethylene (PTFE), SiO2, and polyphenylene (PPL) are specially designed, prepared, and the tribological properties are systematically investigated with references to the special requirements for frictional materials used in ultrasonic motors. The hardness and thermal decomposition temperature of the insulated PI composites are comparable to that of conductive PI composites. However, these insulated materials present excellent friction and wear performance, especially under high loads and speeds. Scanning electron microscopy (SEM) analysis of the worn surface indicates that adhesive and fatigue wear dominate the wear mechanisms. Jingfu SONG. She received her master degree in physical chemistry from Lanzhou Institute of Chemical Physics, Chinese Academy of Science, China, in 2011. Since 2016, she pursued her Ph.D at Nanjing University of Aeronautics and Astronautics majored in materials science and engineering, China. Her research interests include tribology of polymer composites and molecular dynamics (MD) simulations. Yuanhao YU. He received his bachelor degree in aeronautics Engineering in 2016 from North University of China, Taiyuan, Shanxi province, China. Then he joined the State Key Laboratory of Mechanics and Control of Mechanical Structures, at Nanjing University of Aeronautics and Astronautics for his master degree. His research interest includes tribology of polymer nanocomposites. Gai ZHAO. He received his Ph.D degree in physical chemistry from Lanzhou Institute of Chemical Physics, Chinese Academy of Science, China, in 2013. He joined the State Key Laboratory of Mechanics and Control of Mechanical Structures at Nanjing University of Aeronautics and Astronautics from 2013. His current position is an associate professor. His research areas cover the tribology of polymer composite, surface texture, and MD simulations. Jinhao QIU. He received his bachelor and master degrees in mechanical engineering from Nanjing University of Aeronautics and Astronautics, China, in 1983 and 1986 respectively, and the Ph.D degree in mechanical engineering from Tohoku University, Japan, in 1996. He was a research associate from 1986 to 1989 and a lecturer (1990 to 1991) at Department of Mechanical Engineering, Nanjing University of Aeronautics and Astronautics. He was a faculty member at the Institute of Fluid Science, Tohoku University from 1992 to 2006, where he was a research associate from 1992 to 1998, an assistant professor 1998 to 2000, an associate professor from 2000 to 2004, and a professor from 2004 to 2006. Since March, 2006, he is a Changjiang Chair Professor at the Nanjing University of Aeronautics and Astronautics. In 2011, he was selected to “The Recruitment Program of Global Experts”. He became ASME fellow in 2014. Now, he is the deputy director, State Key Laboratory of Mechanics and Control of Mechanical Systems. His main research interest is smart materials and structural systems, including development of piezoelectric materials and devices, vibration and noise control, structural health monitoring, and non-destructive testing. Qingjun DING. He received his Ph.D degree in chemistry from Nanjing University, China, in 2005. He joined Nanjing University of Aeronautics and Astronautics from 1990. His current position is an associate professor. His research areas cover polymer composites and friction.